Baby Doe’s is more than just a women’s boutique. 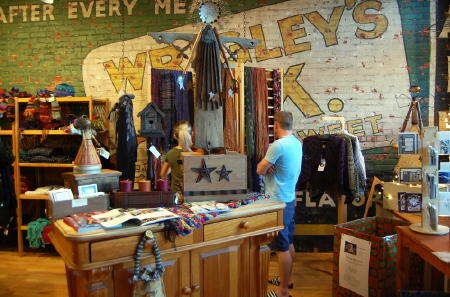 The store is a gathering place for women of all ages to enjoy one another’s company and exchange ideas. It is a place where women go to meet an old friend or possibly make a new one. Baby Doe’s is a place where they know they will get an honest opinion on the jeans they try on or which scarf is the perfect color for them. As buyers we pride ourselves in finding pieces that are fashionable and fabrics that feel wonderful. Our goal is to offer unique styles to enjoy in every day life – from a day in the mountains to a night on the town and everything in between. We are always on the look-out for new lines and new artists to represent in the store so there is always something new to discover at Baby Doe’s. Why the name “Baby Doe’s”? We wanted a name that was regional and reflected the feisty and spirited natures of women we admired and hoped would walk through our doors. Baby Doe Tabor, the 2nd wife of silver baron Horace Tabor, is best known living a life that was not typical of a Victorian Lady. Strong-willed, brave, and determined, Baby Doe Tabor is a Colorado legend and the namesake for the store. Baby Doe’s opened in historic downtown Golden 1999. In 2002, the store moved to a historic building that once housed The Fair Variety Store. We enjoy hearing the memories of locals who bought their penny candy at the Fair and are proud to share the history of the building with visitors. Crucial to our mission to help make Golden a place where people want to be – as residents or as visitors - Baby Doe’s is an active participant in local events, fundraising, and marketing our community. Staff members donate time and skills as volunteers for the Golden Fine Arts Festival and Nancy the store owner is a committee chair for the annual event. The store and the staff also support Golden schools, civic groups, and local events through donations of time and goods. In addition to involvement in the Golden community, Baby Doe’s participates in fundraising efforts for many organizations through shopping days during which a percentage of sales are donated to the organization. We have hosted fundraisers for groups such as Doctors Without Borders, Golden Retriever Rescue of the Rockies, and Sky High Hope Camp – Colorado camp for kids with cancer and their siblings. Gift certificates are available for any amount. Items returned with the original sales receipt can be exchanged or returned for store credit within 14 days of original purchase date. Item must be in sellable condition and may not be washed or worn. Clearance and layaway purchases are final. I LOVE the fact that I don’t go out and see my clothes on other people. Baby Doe's carefully selects a run of sizes and unique items to ensure that my wardrobe belongs to ME. I get compliments ALL THE TIME!! People stop me all the time to ask me where I got the item I am wearing. I always send them to Baby Doe's. Selection is hip, fun, chic… You can rest assured knowing that Baby Doe’s carries items for almost any occasion. I love the handmade items and fiber arts. I love having a unique wardrobe piece and knowing that nobody else in the world has something just like it.